Wash and cut the liver into two and keep in a bowl. Combine 1 tbsp olive oil, garlic-ginger-green chilli paste, pepper powder,coriander leaves and salt to taste in a small bowl. Mix well and pour into the liver and coat very well and leave it to marinate for half an hour. You can marinate for longer. Take remaining olive oil in a shallow non-stick pan and add the sliced onions in hot oil. Add a pinch of salt and stir and fry till the onions turn nice and brown. Take them out and keep aside . In the same pan add the marinated liver pieces and cover and cook on high for 2 minutes on one side. Flip and cook for 2 more minutes and check whether it is done or not. If it is pink in colour when cut, continue cooking for a while or else add the cherry tomatoes and freshly squeezed lemon juice and turn off the gas. Serve on a bed of crunchy Lettuce torn into small pieces topped with caramelised onions. Wow I don’t like liver but that looks amazing! Thank you so much. It really tastes very good. 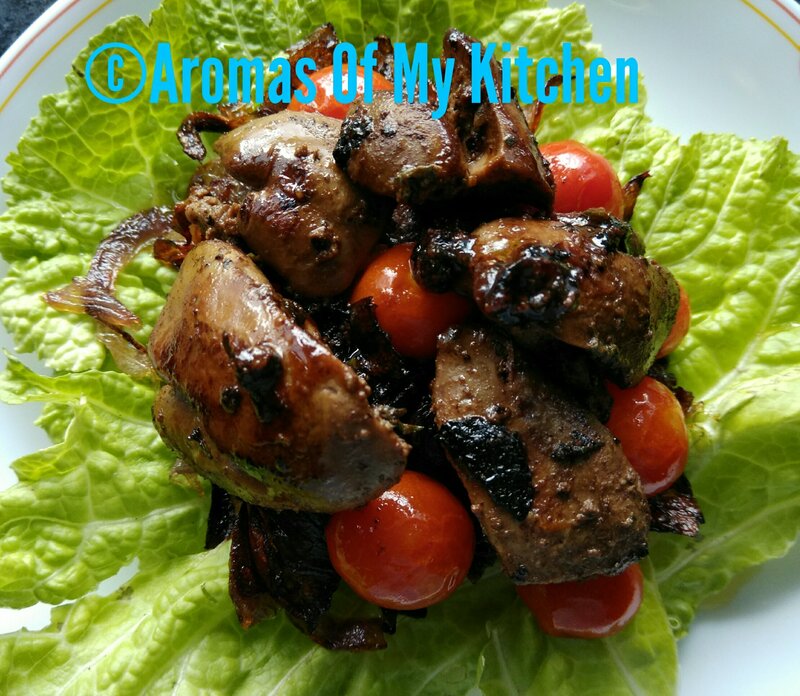 Love chicken liver. With the caramelized onion it sounds great. Nice share Anuradha. Thank you so much for your kind words, Sumith.